The ACRL Information Literacy Program is recruiting a cohort of 3-5 new facilitators to help our current team further develop and facilitate our program. 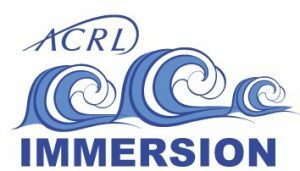 Now in its twentieth year, the ACRL Immersion Program brings together academic librarians for four and a half days of intensive work in teaching and information literacy. With more than 3,100 graduates of previous national and regional sessions, the Immersion Program has transformed individuals, students, and instruction programs nationally and internationally. In 2018, we launched an entirely new curriculum, focused on critical reflective practice and the role of libraries in higher education. We continue to revise the curriculum, based on feedback, assessment, and the institutional needs of participants. We are particularly focused on developing a curriculum that engages critical perspectives on information literacy and pedagogy and addresses inequities in librarianship and higher education more broadly. We seek a cohort of new program facilitators who can bring a range of knowledge and diverse lived experiences, inside and outside of libraries, to join us in this work. The current program facilitators are engaged in a process of professional development in anti-oppressive and anti-racist facilitation, using an approach of cultural humility. We are looking for individuals who will contribute to our collective professional development as program facilitators and help lead our collective work in new directions. We welcome candidates with a range of experience in any aspect of teaching information literacy and engaging critically in the educational role of libraries. Successful facilitators are not required to have a minimum amount of teaching or library experience, formal management experience, or a formal leadership role. We especially welcome candidates with a commitment to, and experience with, anti-oppressive pedagogy. We are looking for candidates who can help us design and facilitate a program that helps people meet the program’s learning outcomes. There are no fixed requirements or long list boxes to check for selection as an Immersion Program Facilitator. You might be relatively new to your position in libraries or have many years of educational experience, inside or outside of libraries. You might have deep knowledge or experience in a single area, or a range of experiences and skills in multiple areas. We are looking for a diverse range of experiences, skills, and knowledge. The complete Call for Program Facilitators is available online. Application materials must submitted via email by 11:59 p.m. Pacific time on Friday, March 1, 2019, to Margot Conahan, ACRL Manager of Professional Development, at mconahan@ala.org. Candidates will be interviewed via phone or online. No travel is required for the interview process. Questions can be directed to Anne Behler at acb10@psu.edu.